Student scientists on the Blue Team at Stepping Stones Day Program designed and launched water bottle rockets as part of their summer unit on force and motion. This fun experiment demonstrated how a build-up in pressure can launch a rocket. Pictured are Madisyn Stuper, Alazaya Bacon and Tristan Graham, students in Robyn Yorker’s class at the Oswego County BOCES Stepping Stones Day Program. As part of a unit on force and motion, students in the class designed and launched water bottle rockets. 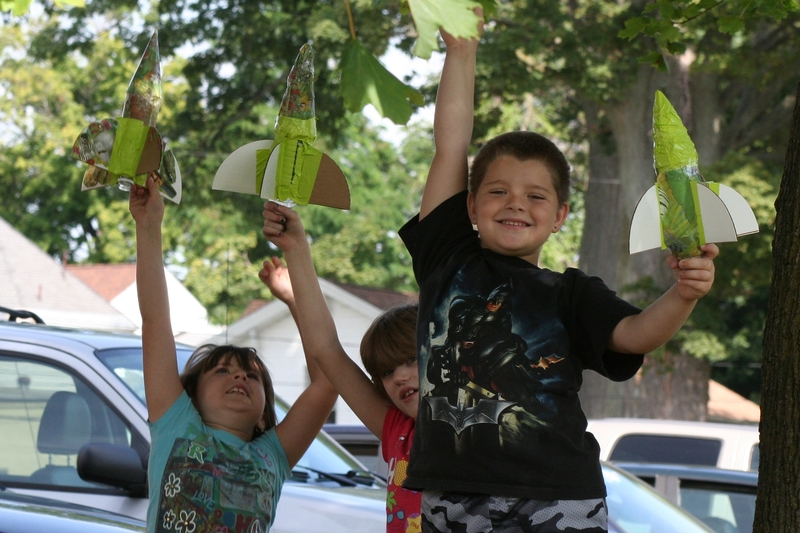 Each student created a rocket using a recycled bottle, heavy gauge cardboard, duct tape, water and a cork. The rockets were decorated and personalized by each student prior to flight. A miniature launch pad was made of snap blocks, and a bicycle pump was used to set the rockets into flight. Through the demonstration, students also witnessed how air pressure can build inside a bottle. When air pushes on the water inside the bottle, it creates enough pressure to push the cork out. The rockets ‘flew’ when the water rushed out towards the ground and the bottle pushed upward into the air.